This is Gerald. 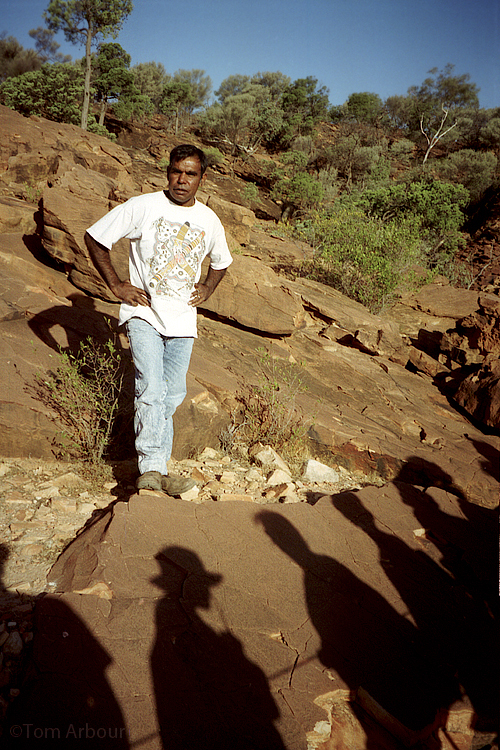 He's standing on one of the most significant collections of Aboriginal rock art in all of Australia, and our group of 20 or so Hiram College students had the privilege to learn about these ancient, rock carvings. I spent three months in Australia, and it shaped much of my current being. This image was shot with a Samsung Maxima Aoom Alpha and film, most likely Kodak Gold or Fuji Superia. Those shadows look slightly menacing - some nice ambiguity in there. when will you put another new photo? Thank you Q. Yes, I agree...to me, this image is quite symbolic of the native Australian's plight since Captain Cook "discovered" the island. Bae- I've got a new one right now.